One of the attractions of Islay in Spring are the vast numbers of wading birds that breed at places like Gruinart. 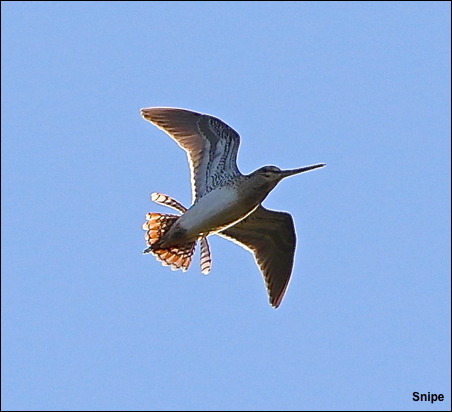 My favourite is the Snipe and the male carries out a display flight called drumming. In the evening he takes wing high in the sky then descends at more than 50kilometers per hour. As he reaches this speed, or more, he extends his outer two tail feathers at right angles and it is the vibration of these two feathers that produces this amazing drumming sound. Prior to digital cameras it would have been almost impossible to capture this display on film but last week on Islay conditions were perfect and I managed one or two acceptable photos.